Alphonsus Maria Liguori was born September 27, 1696 in Marianella, near Naples, Italy. He was 16 years of age when he received his doctorate in civil and canon law. His father, a nobleman, had high hopes for his son, the eldest of seven children. Alphonsus was a prodigy; he easily mastered any subject put before him. By the age of 13, he was playing the harpsichord with the perfection of a master. Poor health kept the young Alphonsus from following his father into the navy. His father decided the best course for his son, in order to attain a position of influence within society, was to become a lawyer. He would never practice law again, nor marry, a double disappointment to his father. Alphonsus spent the next several days alone and in prayer. One day, while visiting the sick at the Hospital for the Incurables, he found himself surrounded by a mysterious light. He then heard a voice say, “Leave the world and give yourself to me.” Alphonsus left the hospital and went directly to the church of the Redemption of Captives. There he laid his nobleman’s sword before the statue of Our Lady, renounced his inheritance, and made the decision to become a priest. This decision caused a rupture in his relationship with his father that lasted roughly two years; they barely spoke to one another, even though Alphonsus was living and studying in his father’s house. He was ordained a priest on December 21, 1726. Alphonsus would spend the next several years attending to the spiritual needs of the lazzaroni, the beggars and street people of Naples. Suffering from exhaustion, Alphonsus, on the advice of his doctor, left the city for the quiet of the countryside. On the Amalfi coast, he would meet another group of people abandoned by the priests of Naples, the goat herders and shepherds tending the hills above the Amalfi coast. Back in Naples, Alphonsus was asked by his spiritual director, Bishop Thomas Falcoia, to look into reports of a nun’s vision concerning the creation of a new order of women. After speaking with Maria Celeste Crostarosa, Alphonsus determined she was doing God’s will and gave her efforts his blessing. Maria Celeste would then tell Alphonsus that she had experienced another vision, one that foretold of Alphonsus himself establishing an order of religious men. This would come to pass a year later, in November of 1732, when he established the Congregation of the Most Holy Redeemer, more popularly known as “Redemptorists,” whose mission would be to follow the example of Jesus Christ, the Redeemer, by preaching the Gospel to the poor (cf. Luke 4,14-21). At this time Alphonsus found himself caught up in the debate over two warring ideas of morality. His celebrated work, Moral Theology, argued for a middle position between rigorism and laxity. The Church sided with him, later declaring him a Doctor of the Church and the patron of moralists and confessors. In March of 1762, the pope appointed Fr. Alphonsus as the bishop of St. Agatha of the Goths, a plum job in a well-to-do diocese with plenty of priests. But Alphonsus was not happy about it. Despite his petitions to be spared this appointment, he threw himself into the task, reforming abuses in the diocese, organizing general missions, and establishing social welfare programs for the poor, even opening his palace to the needy. But ill health forced him to give up the bishopric in May of 1775. Four years later, Alphonsus would suffer the biggest disappointment of his life. His congregation had the blessing of Benedict XIV but had yet to receive royal approval. In 1779 two Redemptorists, Fathers Cimino and Caione were sent to negotiate with the royal court for approval. Instead of negotiating, the two priests allowed the regal authorities to completely rewrite the original papal rule. The vows of religion were changed to mere oaths, the vow of poverty disappeared altogether, the oath of perseverance was omitted, and the local bishops were given power over the internal affairs of the Congregation. General Chapters were wiped out of the text completely. Alphonsus, nearly senile at this point, deaf, blind and and suffering severly from arthritis, was tricked into signing the document, known as the Regolamento. On hearing about the changes, Alphonsus fell into a deep depression. The pope, upset over the Congregation’s willingness to go along with changes that contradicted his papal rule, dismissed Alphonsus from his own congregation! Six years later, on August 1, 1787, Alphonsus died. In 1839 he was canonized. 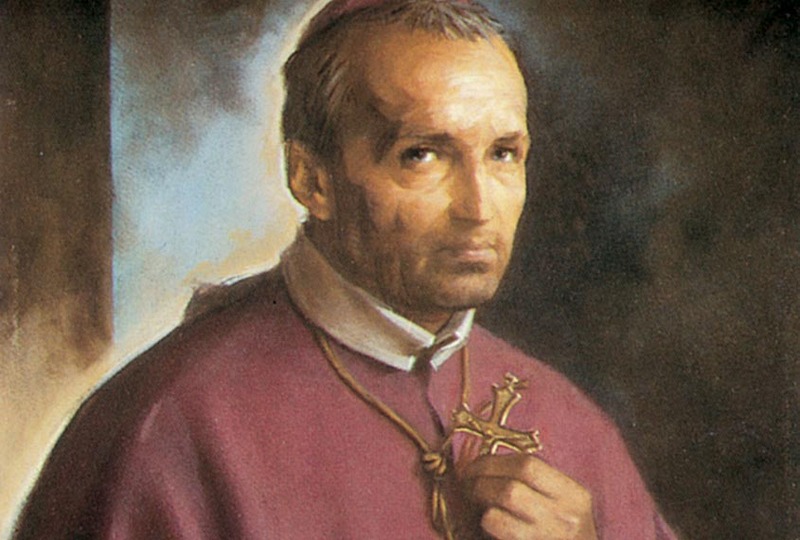 In March 1871, Pius IX declared him a Doctor of the Church, and in 1950 Pius XII declared St. Alphonsus the official patron of moralists and of confessors. He is also the patron saint of vocations and of people who suffer from arthritis. He was also nicknamed “The Teacher of Prayer.” He developed his whole teaching on morality, holiness, and Christian living around his understanding of prayer. It can be summed up simply in his famous dictum: “The person who prays is saved, the person who does not pray is lost.” In other words, the ultimate success or failure of life centers on prayer. How Alphonsus found time to write as much as he did, with everything else he had to do as the founder of an order of men, bishop, preacher, confessor, and missionary, boggles the imagination. He didn’t begin writing until he was in his ‘50s. Despite being in constant pain from a variety of ailments for most of his life, he was able to produce an unprecedented 111 works! In the 226 years since his death, the works of St. Alphonsus Liguori have gone through more than 20,000 separate editions and have been translated into more than 60 languages, making him the most published author in history. Sermons for All the Sundays of the Year. Alphonsus’ skill as an artist shows itself in two very different treatments here. 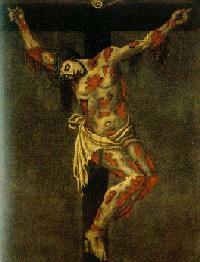 His painting of the crucified Christ, with its bloody depiction of the suffering Redeemer, bore a direct resemblance to what Alphonsus saw depicted in his day in paintings on church walls, statues and the like. Though hard to look at, the painting conveys Alphonsus’ understanding, even at the young age of twenty-three, of the divine love that compelled our Redeemer to sacrifice himself to such a cruel death to atone for our sins. 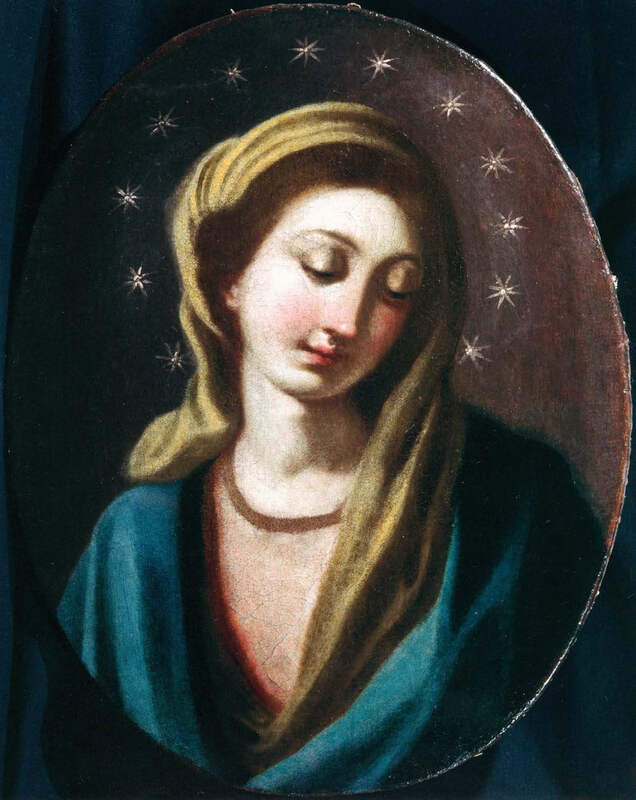 By contrast, his painting of the Madonna, also completed while in his ‘20s, captures both the deep affection he had for her and the love she has for us which shows so beautifully on her face through those soft eyes and gentle features. His drawing of the Madonna anticipates a life-long devotion to our mother that would manifest itself in poetry, song, and prose. Indeed, St. Alphonsus is unique among the saints for his singular devotion to and celebration of the mother of our Redeemer. Alphonsus loved music. He would go to the theater “to enjoy music, and it absorbed me entirely and I thought of nothing else.” His father, Giuseppe, loved music. He arranged for Alphonsus to study with Gaetano Greco, one of the great music teachers of the day. Giuseppe insisted Alphonsus practice three hours a day. He would lock both his son and the teacher in the music room. By the time he was thirteen, Alphonsus was playing the harpsichord with the perfection of a master. As a priest, Alphonsus composed many popular hymns and taught these to the people during his parish missions. He would often add lyrics that turned the mind and heart of the listener to God. The Denver Province produced the first CD’s in the United States featuring the music of St. Alphonsus Liguori performed and sung by some of the world’s finest musicians and vocalists. These CD’s brilliantly orchestrated and arranged by Mr. Ray Herrmann, are available at www.littlelambmusic.com or by calling their offices in Ann Arbor, MI at 888.753.0333. The National Blessing of Arthritics is annually celebrated on the Sunday closest to the Feast Day of St. Alphonus Liguori, one of the patron saints of arthritics and founder of the Redemptorists. Written by St. Alphonsus at age 26. One must never accept unjust cases because they are bad for one’s conscience and one’s dignity. One must never defend a case with illicit and unjust means. One must not load one’s client with unnecessary expenses. A lawyer has the obligation to issue a refund if this has been the case. One must deal with a client’s case with the same care with which one deals with one’s own. One must study the files in order to draw valid arguments for the defense of the case. The delays and carelessness of lawyers can be damaging to their clients, and the latter must be compensated lest justice is sinned against. A lawyer must implore God for help in his defense, because God is the first protector of justice. A lawyer who accepts many cases which are beyond his ability, his strength, and his time (which will often be lacking for the preparation of the defense) is not to be praised. Justice and honesty are the inseparable companions of Catholic lawyers; in fact, they must always be treasured like the apple of their eye. A lawyer who loses a case through negligence must take upon himself the compensation of his client for damages. In defending a case one must be truthful, sincere, respectful, and rational. Finally, the requisites for a lawyer are knowledge, diligence, truth, faithfulness, and justice.